muse-ings: The world's oldest photograph - 1790? A photograph (well, actually a Photogenic Drawing - basically an early photogram) just know as "Leaf" is coming up for auction at Sotheby's and may possibly be the oldest photographic representation in exisitence. It had previously been attributed to William Henry Fox Talbot, one of the founding fathers of photography. 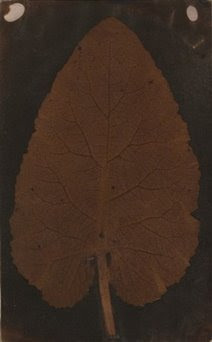 Fox Talbot made a number of other leaf prints and this one was though to have been made by him in about 1839. But new research suggest it might well have been made as early as 1790 by Thomas Wedgwood, James Watt or Humphry Davy, who were all early experimenters in photography. "...Sotheby's says research by a leading photo expert suggests otherwise - that several early photo experimenters could be the authors, including Thomas Wedgwood, James Watt and Humphry Davy, who worked in the medium decades earlier. If that theory is true, it means the photo could have been made as early as 1790..
You can check out the auction at Sotheby's - item #43 (you need to log in to see the full details) - and get your wallet out on April 7th. Maybe you could own a bit of photographic history.... (oh and take a look at some of the other work in the auction while you are there). "In 1984, Sotheby's in London sold a small group of anonymous photogenic drawings that were originally part of an album assembled by one Henry Bright. The photogenic drawing offered here was among that group, and after the Sotheby's sale, it was re-attributed to William Henry Fox Talbot. Dr. Larry Schaaf, the Talbot authority, has questioned that attribution, and in the essay below, explores other possibilities of authorship, including Thomas Wedgwood or members of his circle. It may seem surprising that photogenic drawings are such very rare survivors. William Henry Fox Talbot published the full details of how to make them by February 1839. While fraught with uncertainties, the process was relatively simple, used readily available materials and was widely published in the popular journals in the months following Talbot's disclosure. Public demonstrations were given and kits of materials advertised in the newspapers. One must assume that many hundreds of amateurs, scientists, artists, and others were fascinated by getting nature to draw her own image. Following Talbot's published instructions, an experimenter had only to take a sheet of writing paper, soak it in a weak solution of common table salt, and then brush it with silver nitrate. Light sensitive silver chloride would be formed within the fibers of paper. This sensitive paper was then placed in the sun under a leaf or other object and within minutes the energy of the light would reduce the silver chloride to tiny particles of silver, appearing red or purple. The image was a negative, of course, for where the object blocked the light, nothing happened, but where the light reached around or through the object, the paper darkened. At this stage, it could be examined by candlelight, or fixed to make it more resistant to the sun's rays. Wishful thinking? While if true, it would be the Holy Grail of photography, it seems highly unlikely to be what is being put forth for a host of reasons. Read Robert Leggat's entry on Thomas Wedgwood: "[Wedgewood] had worked closely with Davey, and their work was very nearly a breakthrough, for they had made what one can best describe as photograms. However, they were unable to fix the images, and the story is told that Wedgwood was reduced to examining his pictures furtively by the light of a candle. They also tried using a camera obscura, but the chemicals being used at the time were not sufficiently sensitive. Wedgwood died three years later, aged 34. What neither he nor Davey could find was discovered in 1819 by Sir John Herschel." Perhaps it is by Herschel instead which could still make it the world's first extant photograph.